Calling Mila Turajlic’s documentary “Cinema Komunisto” an account of the history of state‑sponsored film in the former Yugoslavia is factually true. What this academic description omits is that this delightful film also recounts how that country’s film industry became both an instrument and a source of Yugoslavian pride. Josip Broz Tito, a.k.a. Yugoslavian leader Marshal Tito, realized film could be used to spread his country’s political ideals. The World War II partisan film genre, for example, helped remind viewers of major historical battles and a willingness to fight for Yugoslavia. Looking today at footage of extras from different parts of Yugoslavia interviewed on the set of a partisan film brings sadness as one remembers the country’s ethnic disintegration in the 1990s. What put Yugoslavia’s film industry on the map was its state‑run film city, Avala Film. The workers there displayed a determined attention to craft and a “no problem” attitude to new challenges. The results could be seen in excellently crafted uniforms which were easily recycled for up to 20 productions or a massive reproduction of Kubla Khan’s palace. Interviews with Yugoslavian film industry insiders ranging from a studio boss to a set designer gives the viewer an idea of how that country’s film studios came to rival Hollywood. A generous selection of film clips show how well‑crafted the state‑run studios’ films could be, as well as the overly romanticized nature of those studios’ more propagandistic films. Tito played a significant role in building his country’s film culture. Not only did he vet scripts for historical accuracy, but he could make unimagined resources available to filmmakers. This ranged from having actual military personnel serve as extras to possibly allowing an actual bridge to be blown up for a film production. It helped that Tito was such a cinephile that he watched an astounding 8,801 films while ruling Yugoslavia. The emotional heart of Turajlic’s film, though, would have to be Tito’s former personal projectionist Leka. His recollections paint a warm and loving picture of the less public side of the ruler’s personality. The sequence where Leka visits the empty burnt out shell of Tito’s former residence (courtesy of a 1999 NATO bombing) is heartwrenching as the former employee realizes no trace remains of the beautiful rooms he once worked in. Turajlic does admittedly skimp a bit on portraying artistic censorship and ruined careers as the dark side of Tito’s filmmaking culture. Yet the ultimate indictment of Tito’s rule comes from both the currently decrepit state of the Avala Film site and the ultimate disintegration of Yugoslavia after Tito’s death. One may debate whether the films produced by Yugoslavia’s state‑run studios were art or kitsch. What “Cinema Komunisto” shows is that, whatever the verdict, the story behind these films’ making is worthy of remembrance. Jo Sung‑hee’s debut film “End of Animal” also uses one tale as a microcosm for a much bigger tale. In Jo’s case, that bigger tale is life after the apocalypse. Pregnant teenager Soon‑young’s taxi journey to her mother’s house gets irrevocably interrupted by the pickup of a mysterious young man. The new passenger displays intimate knowledge of the driver and Soon‑young. More importantly, the fulfillment of his prophecy that “the angels will descend” lands the mother‑to‑be in a hostile world where the enigmatic all‑knowing man is either her tormentor or her possible savior. The fun of this film comes in seeing how many of its riddles Jo explains and how much he leaves for the viewer to guess. It’s clear that the mysterious young man is a supernatural being of some sort. But whether he’s a herald for the angels or a cosmic teacher, for example, is left for the viewer to decide. Similarly, the film’s titular animal probably refers to human beings, but the nature of that reference is left open. That this low‑budget production keeps viewer attention despite its lack of visual flashiness is a tribute to Jo’s ability to maintain a continual air of enigmatic doom. Its occasional abrupt changes of tone bring new energy to its story. One wonders where Jo’s creative muse will take him. 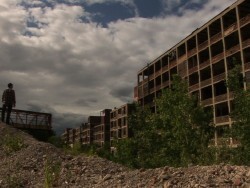 Florent Tillon’s documentary “Detroit Wild City” provides a portrait of a real‑life apocalypse. Once the home of America’s car industry, Detroit is now a city of practically traffic‑free streets and manufacturing plants graced with broken windows and graffiti tags. Without narrative comment, Tillon’s film gives a visual tour of Detroit and introduces viewers to some of its remaining residents. Tillon takes a pessimistic view of seeing Capital revitalize Detroit. The General Motors Renaissance Center office complex mixes workplace and gated community. Young white wealthy residents moving into Detroit arouses viewer suspicions of economic cleansing of working‑class Detroit residents. Yet “Detroit Wild City” finds hope for Detroit’s revitalization in residents who have developed small‑scale reclamations of their portion of the former Auto City. Urban farmers use community gardens to provide vegetables to malnourished residents. A Blightbusters crew tearing down a former crack house offers both community rebuilding and an outlet for physically channeling personal frustrations with the state of Detroit. Tillon does not limit determinations of Detroit’s future to human agency. Seeing former auto factories overgrown by vegetation or birds using abandoned skyscrapers as impromptu nesting cliffs feels like humanity’s small repayments to Mother Nature. In the end, Tillon offers no prescriptions on the nature of Detroit’s future direction. The only certainty seems to be that the city’s residents are determined to stay.